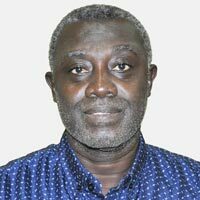 Dr Robert Asiedu is the Director, Research for Development, for IITA-West Africa. He also leads the Institute’s work on Biotechnology and Crop Improvement. He joined IITA in 1989 to work as a breeder of root and tuber crops, after a Postdoctoral Research Fellowship at the International Maize and Wheat Improvement Center (CIMMYT), Mexico where he worked on the transfer of useful traits to wheat from its wild relatives. Dr Asiedu has supervised or coordinated collaborative R4D projects with NARIs in Africa, published widely in international peer-reviewed journals, and contributed to the formal release of several high-yielding and pest-resistant yam varieties by national research partners in Nigeria and Ghana. Together with university lecturers, he also co-supervised the thesis research on root and tuber crops of many postgraduate students, mostly in Africa. Dr Asiedu is a Ghanaian national. He holds a PhD degree in Agricultural Science from the University of Adelaide, Australia, and a BSc Honors degree from the Kwame Nkrumah University of Science and Technology, Kumasi, Ghana. A Chartered Biologist, he is a member of the Society of Biology and the International Society for Tropical Root Crops.